This past school year I've been watching some of my teaching friends use green screen technology with their classes. 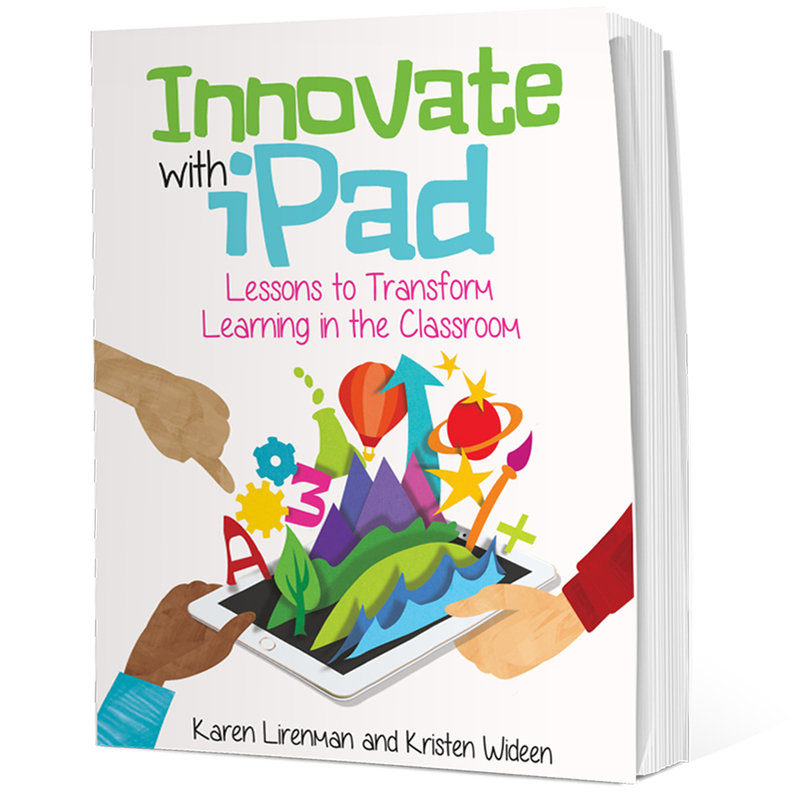 These include Diana Williams and her amazing KIVA Ninja Video, Kristen Wideen and her Nuffle Bunny Adventures, and Kathy Cassidy sharing First Nations learning. 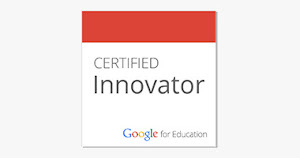 It was something I wanted to try with my class as well, and finally right near the end of the school year we did it too. At the time my class had been studying about Canada, and more specifically symbols of Canada. What better way to share what we were learning than with a green screen project. 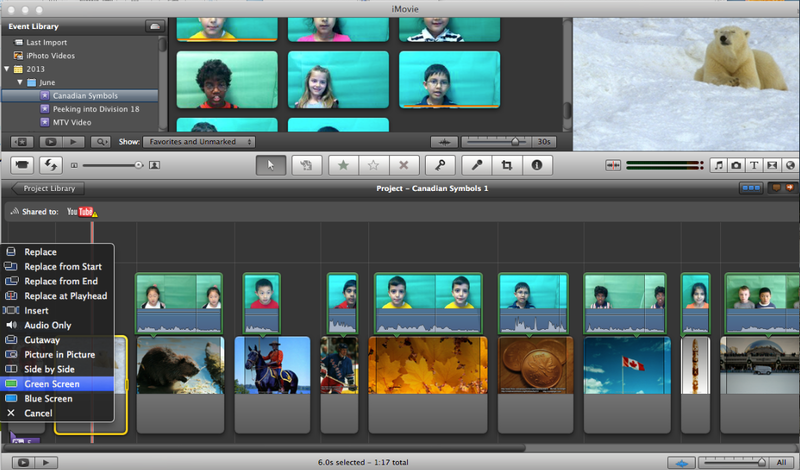 For this project my students selected a Canadian symbol, were filmed in front of a green screen talking about the symbol, and then the video clips and images about the specific symbols were put together using advanced features in iMovie. It was actually pretty easy to do. Let me explain in a bit more detail. First off you need a green screen for filming. I used the most basic green screen I could find - large green paper off the roll of paper that we have hanging around in our hallways. I know Kathy used green plastic table clothes that she purchased at the dollar store (just make sure they aren't too thin so the items behind them don't come through). Others have used green fabric draped from the ceiling to the ground. The trick is that it's chroma key green. My green screen, simple green paper from a large paper roll. Next you need to film your students speaking in front of the green screen. The key though is that no other background is in the footage. I had some older students come and help me film but I couldn't use any of their footage because some of the regular wall was showing in the footage. You also need to check out your lighting. When I filmed we were at the end of the hallway with a glass door leading to the outside right beside us. It turns out it was too bright on my student's faces so I had to cover up the light. There was however enough light from the hallway itself. Sometimes though if where you're filming is too dark you'll have to add light to your subjects. I'm no professional photographer here but it is something to be aware of. This filming could easily be done by a student. It's actually a good idea that before you start filming that you have an idea of which image (or video) will eventually be on the green screen so that you can position the student in the just right spot for filming. In addition it's really important that your student not wear green (or yellow or blue for that matter) because that part of them will act just like the green screen itself and it will be blended right into the background. I learned this the hard way but it was pretty cool to have one of my students fade into the maple leaf background, and another to have a movie playing on her head band. It was a learning experience for me too. 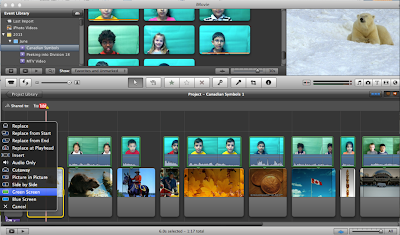 Once you have your background and green screen images all together it's time to move into iMovie. Unfortunately green screening is not yet possible on the iPad version of iMovie but it is possible on iMovie for your Apple desktop or laptop. 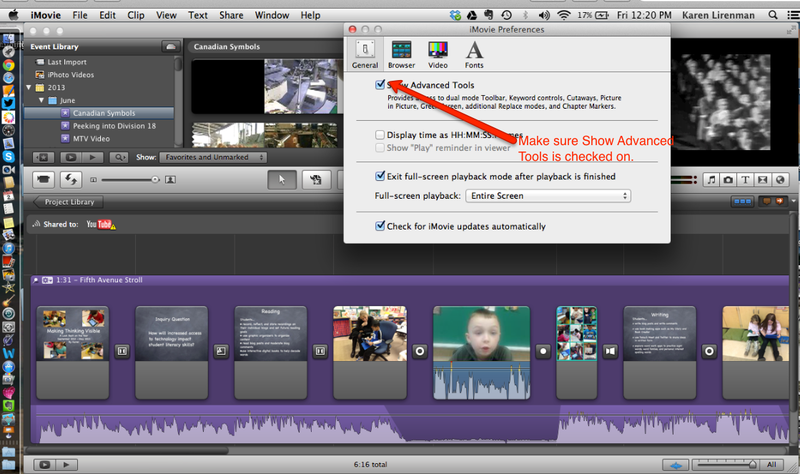 The key is finding this feature when you're in iMovie. To do this under the iMovie tab at the top of your screen click down to where it says preferences. Then make sure you check "Show Advanced Tools". 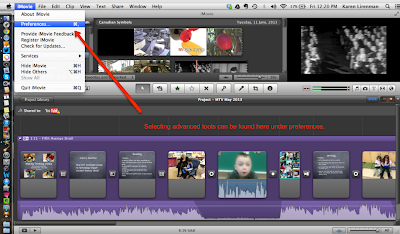 This opens up a ton of other really cool iMovie features which you may not have know existed. It's also where you find the green screen feature. Where to find your iMovie preferences. Where to turn on advanced features. With advanced features turned on it's time to get started. First add the background image. After trial and error I ended up adding them one at a time. Background image, then green screen footage. It was easier for me to do it this way so that I didn't get too far ahead of myself and I could match the length of time the image (or video) was being played to the green screen footage. But I get ahead of myself. Once the background image is added to iMovie drag the green screen footage directly on top of the background image. This (when advanced features is turned on) will open up a screen with many options to choose from , one being green screen. Click that. Then adjust your image so it's the same length as your video and you've done it. Repeat the process over and over again until all the clips have become official "green screened" clips with the background images replacing the green screen. Of course if you have a long video footage and you want to have a few backgrounds flash behind during the footage that's no problem either, Just drag them into place like you would for one image and drag the green screen footage on top. Drag the green screen video op top of an image and the advanced features menu will show just like in this image. Then proceed as you normally would with iMovie and create your own video. Here's my first attempt at using green screen technology with my students. As you can see there are still a few errors but it was a great learning experience for me and my students. I'd love to see how you are using green screen technology too. Thanks for sharing how to do this! I'm thinking of using this with my 4th graders to take pictures of different areas in the school and then film them stating the rules for the specific area. Thanks for the awesome step by step! I'm looking forward to trying this now I know how to do it! A volunteer did it for us when I worked with Kristen, and I had no idea how he did it! Thanks for the feedback Steve. I was aware about not wearing green but I was surprised to see yellow and blue disappear too. It was good for a few giggles though and all was not lost in th process. And yes, I agree lighting is important I'm just not sure how it works. When I first did it the film footage was too bright and the kids were getting lost in the clip. When I covered up the light form outside it was much better. Obviously there is a light balance here of course I'm just no expert on explaining it. I can see though how shadows (depth?) would be important. Thanks again Steve. I appreciate your support.